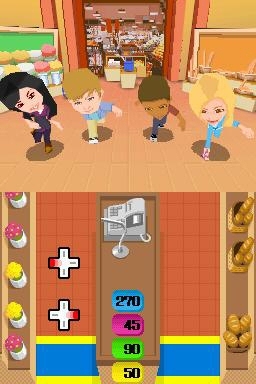 Sonny With a Chance is a Disney game inspired by one of their TV shows aimed at kids. I'll be honest: I don't watch any of them, but I don't mind taking the time to try out the respective games. 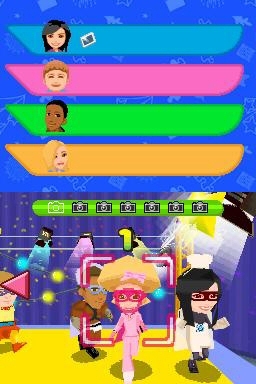 In the game, you go backstage with the cast of the "So Random" comedy show for kids (the fictional comedy show featured in the Sonny With a Chance TV show). While there isn't an actual story to be told, you go around the TV show sets in a Mario Party-style board game, where you compete in strange mini-games with your AI opponents when you land in certain spots. 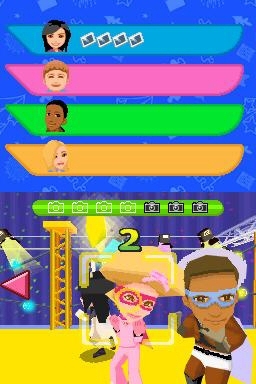 You can play as any of the cast members: Sonny, Tawni, Nico, Grady or Zora. As you progress around the board, you accumulate fan mail. There are about 40 mini-games to be found, some are more fun to play than others. 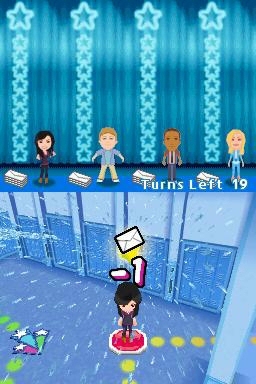 These include running along a school hallway by pressing A and B, and hiding behind pillars to dodge the hall monitors; a rhythm game where you press the right buttons at the right time, like playing DDR (it was actually called random mall dancing); picking up fan mail of the color that corresponds to your player; hitting a punching bag as quickly as possible, before someone else gets it first; popping balloons and hoping you don't get a pie in the face; blowing as hard as you can to knock down cardboard cutouts of a cast member; eating lobsters that are reveal from lifting the lids of serving plates; dodging fast food; playing musical chairs, and more. Some of the concepts are just so silly that you wonder how they didn't belong in a Wario game! Fortunately, there are always instructions to tell you what to do, except when playing on the highest difficulty. The better you do on the mini-games, the more fan mail you get. Obtain 100 letters from fans before any of the other participants to win the game, or get the most fan mail possible by the end of the 20 turns. There are also two mini-games which were exclusively designed for the DSi, but since I don't own one, I probably won't be able to unlock them on my DS Lite. 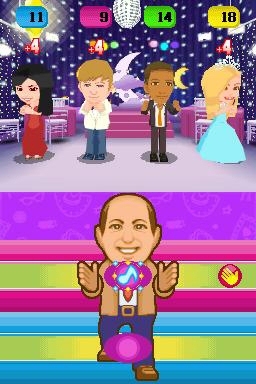 I did learn that one of the DSi exclusive mini-games involves tilting the system to make your character change direction. Depending on how well you do on the board game, you unlock costumes, DGamer extras and earn Fun Tokens, the currency which you can use to buy new costumes for the characters on mini-games you have unlocked on the board game. 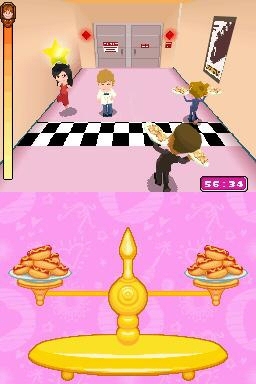 Replaying these mini-games also awards you with Fun Tokens. Sonny With a Chance also includes access to the DGamer online community, where you can chat with other users, customize your avatar, get new items for your game and show off the honors you have earned in the Disney games you play. Overall, Sonny With a Chance wasn't a very engaging experience for me. Ok, fine, I am definitely not part of the primary target group of girls aged 8 to 12, but it seems like the game lacks in content. The idea of having to purchase the mini-games with Fun Tokens instead of having them just unlock and become available as you beat them on the board game seems redundant. I can understand using the Tokens for costumes to make your character look cool while he or she hops around the boards, but the mini-games? Considering how repetitive they get during a given board, they should be unlocked according to total accumulated fan mail or just have them all there from the start. I got the same three mini-games - lobster eating, ladder climbing and random mall dancing - respectively three, two and three times in one board game session. I guess the mini-games randomizer isn't as random as I thought, and considering the 40 activities available, it should be fairly easy not to repeat the mini-games as much in a single session. While some of the mini-games are funny, overall the contents of this So Random game isn't nearly random enough, making a single board game playthrough repetitive and somewhat tedious, especially since you can't skip your opponents actions. Parents might want to know there is some mild violence in the form of smacking or pushing your opponents out of the way. On the positive side, there are five different boards to complete, with three difficulty levels, plus a DS Download Play multiplayer option that allows up to four players to connect to the same board with no need for additional cartridges. 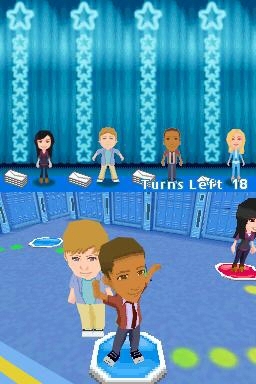 If you enjoyed Mario Party on the DS, you will probably like Sonny With a Chance. Especially if you follow the TV show, since you will be able to relate to the characters and scenarios more than I could. It's definitely not for everyone, and hopefully this review will help you decide if this is your kind of game. Special thanks to Laura Bryce and Disney Interactive for providing a copy of this title.